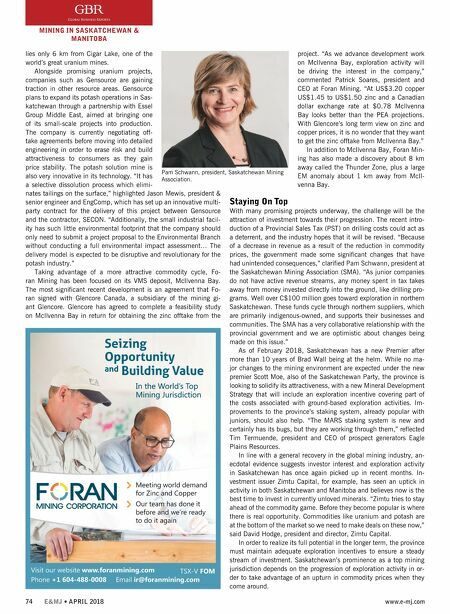 www.e-mj.com E&MJ • APRIL 2018 75 MINING IN SASKATCHEWAN & MANITOBA Recognized as the second top destination worldwide for mining in- vestment by the Fraser Institute in 2016, Manitoba has captured interest amongst global mining communities and potential investors. Primary criteria in the survey, which ranked 104 mining jurisdic- tions globally, included resource potential and policy attractiveness. Although in the latest survey in 2017 Manitoba slipped down the rankings due to increasing uncertainty around the issuing of permits and consultations with First Nations, it still ranks relatively highly on these scores. Historically focused on agriculture, Manitoba's government has been committed to diversifying the province's economy. Manufac- turing remains Manitoba's largest sector, accounting for over 12% of GDP, with mining at about 5% in 2015. However, Manitoba is somewhat of an enigma considering its apparent attractiveness ver- sus the relatively small size of its mining industry. Being relatively underexplored and having suffered alongside other jurisdictions dur- ing the mining downturn, the province's sector has some way to go before reaching the light at the end of the tunnel. Manitoba's mining industry is largely built around its two produc- ers: Hudbay Minerals and Vale. Hudbay, founded in 1927 as Hud- son Bay Mining & Smelting Co., has played a significant role in the province, largely centered around its Flin Flon operations. Today, the company's activities extend across the Americas, with a primary fo- cus on the discovery, production and marketing of base and precious metals. Hudbay remains hugely important to the province, running a highly profitable polymetallic operation, employing approxi- mately 1,400 people as well as 200 con- tractors. The company's central focus is also shifting somewhat from Flin Flon to Snow Lake, where its Lalor operation is located. "We have been in Manitoba for 90 years, a period over which we have mined over 150 million mt of ore in the area," commented Andre Lauzon, vice president of the Mani- toba business unit at Hudbay Minerals. "The last year has been transformational for us. Lalor had its first production in 2012, and by last year our idea there was to maintain a 3,000 mt/d operation until the end of the mine life. Yet, we identified some opportunities to increase that by at least 50%." As a result, the mine is already working at a rate of 4,000 mt/d with anticipated production levels reaching 4,500 mt/d in 2018. "In terms of timing, this has been very positive due to the high zinc prices," continued Lauzon. 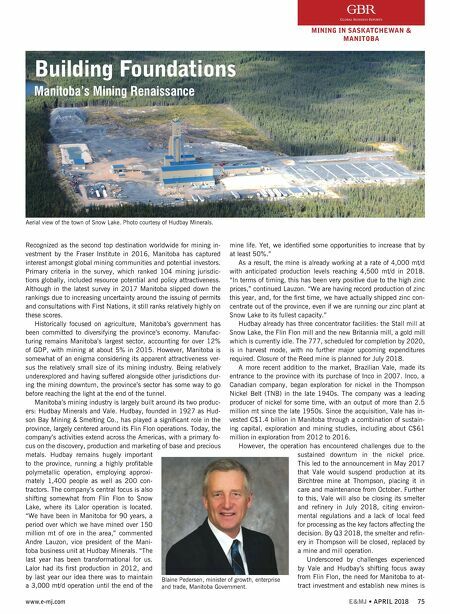 "We are having record production of zinc this year, and, for the first time, we have actually shipped zinc con- centrate out of the province, even if we are running our zinc plant at Snow Lake to its fullest capacity." Hudbay already has three concentrator facilities: the Stall mill at Snow Lake, the Flin Flon mill and the new Britannia mill, a gold mill which is currently idle. The 777, scheduled for completion by 2020, is in harvest mode, with no further major upcoming expenditures required. Closure of the Reed mine is planned for July 2018. A more recent addition to the market, Brazilian Vale, made its entrance to the province with its purchase of Inco in 2007. Inco, a Canadian company, began exploration for nickel in the Thompson Nickel Belt (TNB) in the late 1940s. The company was a leading producer of nickel for some time, with an output of more than 2.5 million mt since the late 1950s. Since the acquisition, Vale has in- vested C$1.4 billion in Manitoba through a combination of sustain- ing capital, exploration and mining studies, including about C$61 million in exploration from 2012 to 2016. However, the operation has encountered challenges due to the sustained downturn in the nickel price. This led to the announcement in May 2017 that Vale would suspend production at its Birchtree mine at Thompson, placing it in care and maintenance from October. Further to this, Vale will also be closing its smelter and refinery in July 2018, citing environ- mental regulations and a lack of local feed for processing as the key factors affecting the decision. By Q3 2018, the smelter and refin- ery in Thompson will be closed, replaced by a mine and mill operation. Underscored by challenges experienced by Vale and Hudbay's shifting focus away from Flin Flon, the need for Manitoba to at- tract investment and establish new mines is Building Foundations Manitoba's Mining Renaissance Blaine Pedersen, minister of growth, enterprise and trade, Manitoba Government. Aerial view of the town of Snow Lake. Photo courtesy of Hudbay Minerals.